The pet addendum is a document which a landlord will employ if they wish to allow a tenant, to have one (1) or more pets in their domicile. 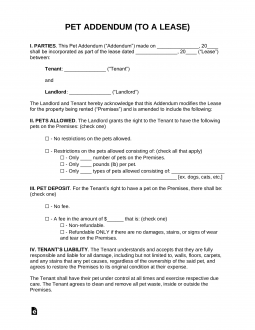 This legal document states in writing that the tenant will be responsible for their pet(s), requiring that they keep their animal(s) under control, that they do not make an excessive disturbance on the property, and that the pet owner is responsible for any property damage caused by their pet(s). The landlord can set a fee or deposit that the tenant must pay that is either non-refundable (a one-time fee) or refundable (like a damage deposit). Furthermore, the landlord will define the amount, type, and size of pet(s) that the tenant is allowed to have. This document is legally binding and, therefore, both parties must comply with the details of this written agreement. Step 1 – Download in Adobe PDF, Microsoft Word (.docx), and Open Document Text (.odt). Step 2 – Enter the date of the Pet Addendum agreement, followed by the date of the Lease Agreement, the name of the tenant and the landlord. Step 3 – Write in the number and type of pet(s) that the tenant will be allowed to have. Next, write the number of pounds that a pet is permitted to weigh. If the landlord wishes to charge a fee or deposit related to the tenant owning pets, they must enter the dollar amount of this fee/deposit and indicate whether it is refundable or not. Step 4 – Further down the page, the date must be provided where indicated (day, month, year).